Fraserburgh lies on the north-facing coast of Buchan just after it has rounded the corner from Aberdeen towards Inverness. In effect, it stands at the end of one side of the mouth of the Moray Firth. 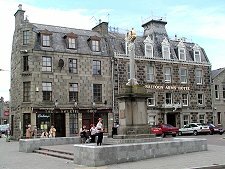 The town had an early start, being chartered in 1546, and was already in use as a harbour before the first stone pier was built here in 1576 by Sir Alexander Fraser. This was the start of extensive work on the harbour over the following centuries. In 1572 Sir Alexander had also built a tower on Kinnaird Head, at the northern tip of Fraserburgh. Sir Alexander's name was no coincidence: the town he founded was named after him. In 1787 the newly formed Northern Lighthouse Trust leased the tower on Kinnaird Head from the Fraser family and converted it into the Kinnaird Head Lighthouse. 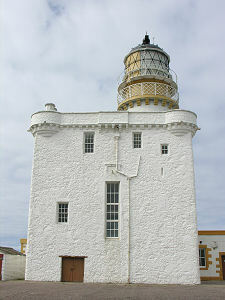 This remained in use as a manned lighthouse until 1992, when it was passed by the Northern Lighthouse Board to Historic Environment Scotland. The lighthouse has since formed a part of the attractive Museum of Scottish Lighthouses, housed in purpose-built premises at Kinnaird Head. 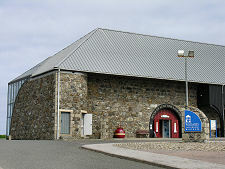 When you have visited the museum, the nearby Fraserburgh Heritage Centre is also well worth a look. 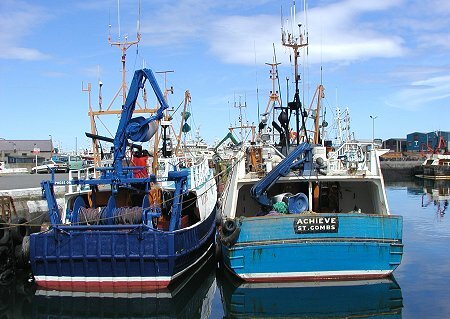 In 1894 there were over 800 fishing boats based in Fraserburgh: almost one for every ten people living here at the time. 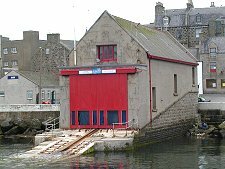 If you walk around Fraserburgh Harbour today you realise that the number of boats has shrunk, but also that their size has increased. 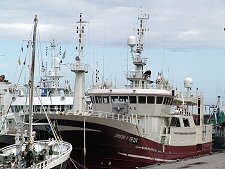 Some of the very large fishing boats on view dwarf what you will see in most other Scottish fishing ports. You get a sense that some of these ships really mean business: it is only a shame that this is not an industry with brighter prospects in these days of quotas and overfishing. 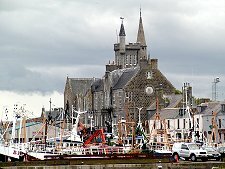 Fraserburgh's harbour is wrapped around the east side of a strikingly handsome grey stone town. At its heart is the Mercat Cross in a busy square overlooked by the Saltoun Arms Hotel (and the Sweetie Shop) on one side, and the Tourist Information Centre on the other. The square lies at one end of the main shopping street. 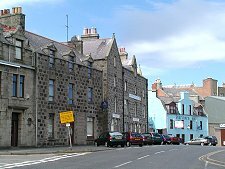 Fraserburgh also retains elements of its time as a traditional old-fashioned seaside resort. These days it successfully caters for modern visitors wanting to look at the boats or the lighthouse museum, or the sea, the sand and the rocks. 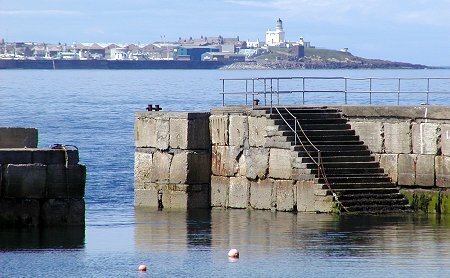 But until it became more fashionable to fly to Spain for a package holiday, Fraserburgh successfully attracted visitors with its esplanade, its open air and indoor swimming pools, and its reputation for bright and clear, if often cool, weather.